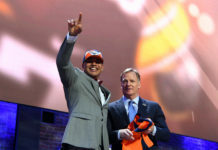 The defending AFC Champion Denver Broncos entered Sports Authority Field at Mile High with all the confidence in the world but left battered and bruised after being simply outplayed. On the both sides of the ball the Broncos failed to create mismatches, create pressure on the opposition and execute when the game was in the balance. The result was a demoralizing 24-13 loss to the Indianapolis Colts and the end of another disappointing season. And instead of continuing on to another AFC Championship the team was left to explain their shortcomings. The game started ideally for the Broncos. They forced the Colts into a quick punt and proceeded to march down the field and score the first touchdown of the game. Little did they know it would be their only lead of the day. Despite a awful first half in which the offense only converted one third down and totaled only 71 passing yards the Broncos were down 14-10 when the team took the field for the third quarter. 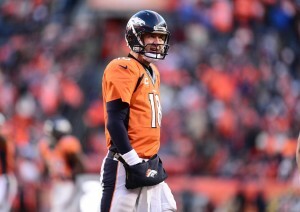 However, Manning could not shake the tough start and continued to struggle to throw the ball. The defense buckled down and even came up with two timely interceptions but Manning and the offense could not take advantage of them. He completed only 26 passes on 46 attempts and consistently missed Emmanuel Sanders and Demaryius Thomas. The two standout wide receivers totaled only 12 catches on 27 targets for a measly 105 yards receiving of the teams paltry 211 total for the game. The astonishing thing about the loss on offense was that it was not turnovers or fumbles that was their undoing, it was just a day in which they had no rhythm. Sanders repeatedly said it was a complete lack of execution on their part that was to blame. There were several chances for the Broncos to change the momentum of the game but at every turn they failed to execute. A second quarter, missed Adam Vinatieri field goal only gave way to a Broncos punt. A crucial interception before half by Bradley Roby produced a Conor Barth field goal. Lastly, a huge fourth down conversion by Anderson in which he broke a tackle in the backfield and two others on his way to a seven yard gain gave way to just another Barth field goal. 21-13 was the closet they would get to the Colts in the second half. Anderson was the only consistent source of offense for the Broncos as he rushed for 80 yards on 18 carries and added six receptions. However, he had a tough time explaining the teams’ performance and was nearly in tears as he spoke from his locker after the game. Despite Luck’s two interceptions he led the Colts to an impressive win. He spread the ball around and made it difficult to stymie their offense. There were no huge performances by Colts in the game and it may have made it harder for the Broncos to dissect what happened. Talib was direct in defining his feelings but could not explain the play on the field after the loss. The Colts took a quick 21-10 lead in the third quarter after converting a critical third and 16 to Coby Fleener and a 15-yard touchdown strike to Hakeem Nicks. The Broncos offense simply could not answer the Colts in the second half. When Denver appeared to piece together a drive, a failed third down attempt would it. The Broncos converted only their second third down with 3:49 left in the third quarter and finished four for 16 on the day. The closest they would get was when Barth’s second field goal brought the score to 21-13 with 13:55 left. Manning blamed himself for the third down failures and credited the Colts defense for their effectiveness throughout the game. “You have to be sharp in your execution and go out there and make plays. I didn’t make enough plays and offensively we just thought that they were better than us on third down,” Manning said. A 8:14 drive by the Colts ended with another Vinatieri field goal but the game out of reach with 4:06 remaining. After two more futile drives by the Broncos they were left to contemplate the season and the failure to reach their goals once again. Chris Harris Jr. had a remarkable comeback year and earned himself a Pro-Bowl but was not shy about his thoughts as the season suddenly ended. The NFL is a highly competitive league and some may say that reaching the playoffs deems a season a success. No one in the home locker room would echo that sentiment Sunday evening. 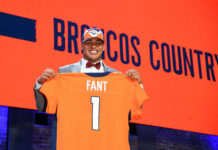 The loss to the Colts is yet another “wasted” season and who know what the results will bring but time has yet to heal old wounds and the Denver Broncos just added another one. Email Sam at [email protected] and follow him on Twitter @SamCowhick. For complete coverage of the Denver Broncos here.